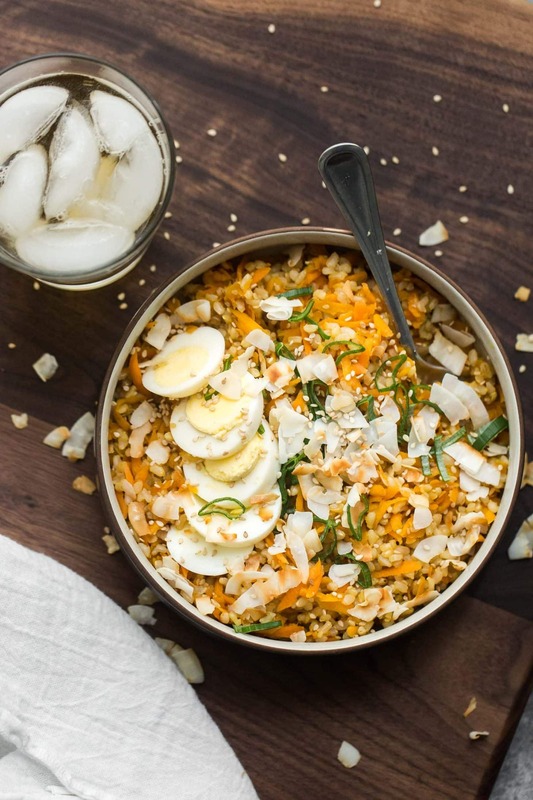 Ginger Brown Rice with Carrots | Naturally. Many recipes I have are first-time recipes, meaning all the components to the recipe are all made as part of the recipe. However, I have quite a few second-time recipes: recipes that can be made with leftovers. 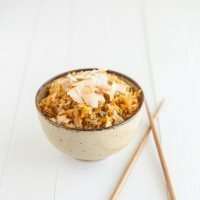 This ginger brown rice dish is one of my favorite second-time dishes that’s perfect for leftover or extra cooked brown rice you have. It comes together quickly and can serve as a solid side or as a main (with the help of added eggs or beans). This recipe is also highly adaptable and can really be used with any grain. In a medium skillet, heat oil over medium low heat. Add in garlic and ginger, cooking until they both become fragrant-roughly two minutes. Stir in shredded carrots and cook for 1-2 more minutes. Whisk together soy sauce, honey, vinegar, and sesame seeds. Pour over carrot mixture and cook until heated through. Finally, stir in rice and cook for 3-4 minutes or until rice is warm. + Over the years I’ve dropped the honey from this recipe but I chose to leave the recipe as I originally posted it. If you’re looking to make this vegan or just don’t want to use the honey, drop it from the recipe- it’s perfectly fine without it. Grains: If you’re not working with any leftover grains, I recommend making this with millet or quinoa for the ease and quick cooking. 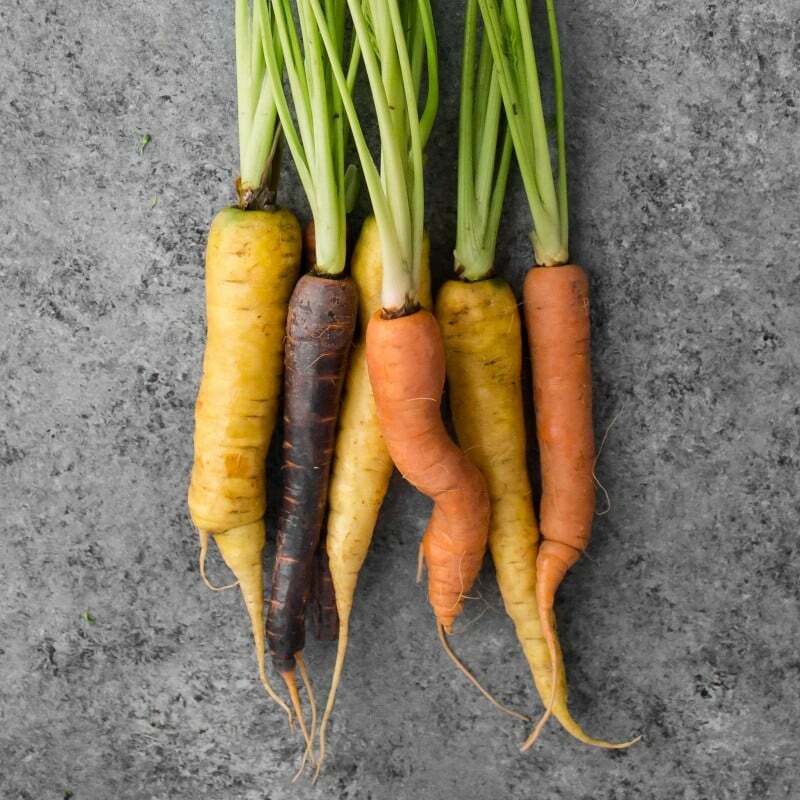 Carrots: As discussed in the comments, any root vegetable would work- it just might take some adjustment time on the cooking side. Shredded sweet potatoes, turnips, rutabagas, and even celeriac (you might want to mix this with another root- a bit heavy on the flavor). + Originally posted on April 6th, 2012. Last updated on March 6th, 2016. I like ginger and I like carrots, so this rice IS for me! Yum! This is going on the menu for the week! Sounds fantastic. 🙂 Have a great weekend! I think I started appreciating carrots last year when I got some really good ones at the farmers market. What a great use for them! I always love your recipes. I wasn’t raised learning how to cook or eat naturally, but with your recipes, it seems attainable and delicious. Thank you for opening up a whole new world to me. First off, thank you for such a sweet comment. It’s hard to express through text how much it means to me! Second, pin away! Thanks for your comment, Jessica! I actually don’t know–what’s the controversy with pinning right now? Yum! What a recipe. And look at those carrots! This might be a dumb question, but do you do anything special to freeze your grains? or do you just cook them and toss them in a ziploc or freezer container? Thanks! Nothing special- I usually under cook them just a bit if I know I will be re-cooking them in a dish but other than that, I just let them cool and toss them in the freezer! This looks really great. I’m not a huge fan of carrots, but when paired with ginger they become something really special. I too make a batch of grains and beans over the weekend. Bookmarking this for one of those nights when I’m drawing a blank when it comes to dinner ideas. I made this for Easter dinner–WOW! It was great! My whole family really loved it! I found this recipe for brown rice at the same time: http://www.saveur.com/article/Recipes/Perfect-Brown-Rice. I doubled the rice and froze half on your suggestion (just in a ziplock bag). It worked out perfectly. Thanks so much! So glad it worked- thank is exactly how I make my rice and it never fails! Thanks for the recipe! I made just it for lunch, just halfed all the ingredients. I used black forbidden rice instead since I had some leftover in the fridge, and I threw some grilled ahi tuna in at the same time as the rice, since I had some of that leftover in the fridge too! I made this today for the first time, and I am happy with the results. 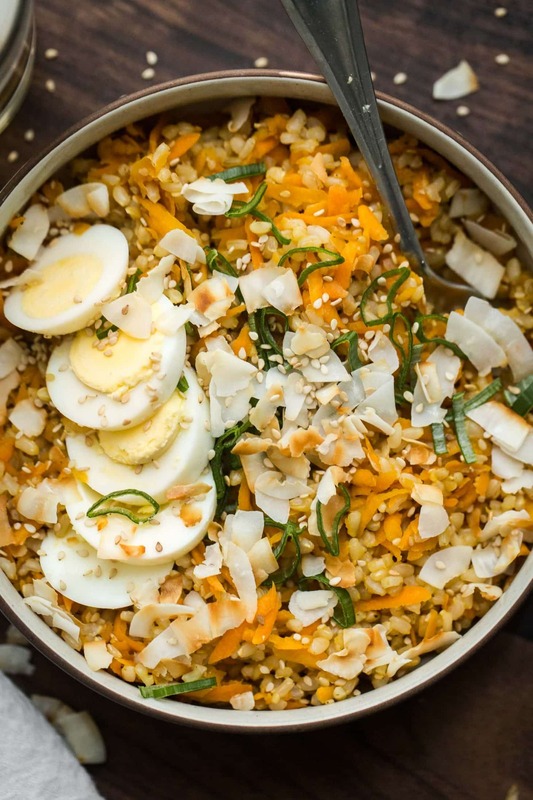 I had been looking for a new way to eat brown rice, and this recipe caught my attention. Next time I make it I want to try adding some chopped up bits of McIntosh apple, as I have found that to go very well with carrots. HI Erin, I made this recipe tonight for dinner. So delicious! I added baby bok choy and topped it with poached wild salmon. Thank you for sharing the recipe and helping me use up some of my over-abundance of carrots. This will definitely be a go-to recipe for my family. I just tried this recipe and I love it! Colorful, tasty, simple, and I always have those ingredients around. I used apple cider vinegar instead of the rice wine vinegar and omitted the sesame seeds. Definitely will be a staple here, thank you! however. It was a little burned, but still a quite delicious topping! This recipe is really good!!! Thanks! Omg omg finally made this one. SO GOOD! I will definitely try this. Had not thought of freezing rice ready to use, do you defrost it before frying? Usually- I’ll pull a couple cups out to keep in the refrigerator for 1-2 days. I found this post and recipe last fall and have to say: we have made it so many times I’ve lost track! All three of us love it, especially the toddler. Sometimes I increase the amount of carrots, just because it’s always nice to get more vegetables in our diet, especially when they’re so tasty. And a couple of times I’ve added cooked, shelled edamame beans (I can find them frozen) in the third step. I’ve fried some of the leftovers with a beaten egg on occasion. Thanks for a great recipe! It serves 1 large portion or 2 side portions! Tasty, tasty! I love when rice vinegar and ginger get together. I’m not a huge tofu eater, but I think it’d be good in this dish. I was wondering if this would be good if I replace the carrots with another root vegetable (like beets, parsnips or sweet potatoes). This looks absolutely incredible Ella! I love carrots, and I think the ginger would add a perfect spice to it! Yummy! This sounds like the perfect Springtime side dish! I will definitely try this out this week! Has anyone made this with a protein source other than eggs? I was wondering what type of bean would be best or if you had any other experiences? Thank you! I can’t wait to try it. Hi Jennifer- If not eggs, I usually make this with chickpeas that have been lightly toasted (for a little warmth). Hope that helps! Saving this one! Looks so comforting and delicious. Omg, I just made this. It is absolutely AMAZING!!! OMG, this is hands down the best dish EVER!! I made it last week and both my husband and I were amazed at the amount of flavour packed in such a “simple” dish!! I know and cook with all the ingredients, but for some reason putting them together in this way creates the most amazing dish. I would be happy to eat this and only this for the rest of my life :0). Thank you very much for this recipe. Have been looking around your site (love it!) and will be making more recipes soon, can’t wait to try them out! Oeps, guess I liked it so much I felt the need to post the same comment twice ;0) (although the second was much more elaborate)..
What a wonderful recipe!!! I made this fabulous dish this evening with a few modifications ….I omitted the coconut flakes, scallions & eggs. I drizzled some fig balsamic vinegar on top along with a few drops of some hot sauce. Delicious!! Next time, I’ll add some crispy baked tofu. Many thanks for this recipe!!! After being offered my dream job today, I am celebrating with your delicious recipe and a glass of bubbles. I am feeling grateful and full on yummy goodness! Thank you! This was excellent as a side to ginger beef (without egg)! Thanks!